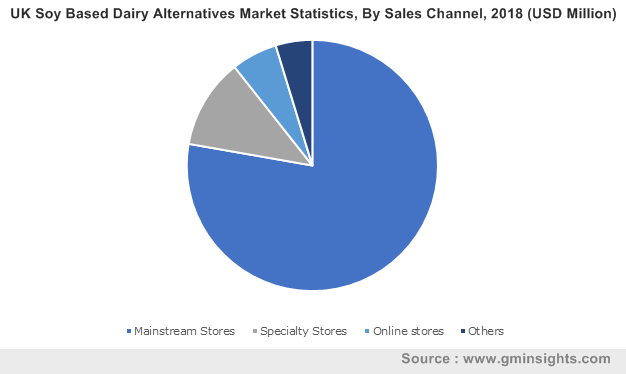 Global Dairy Alternatives Market size was valued at over USD 18.5 billion in 2018 and is projected to witness more than 10% CAGR from 2019 to 2025. Increasing flavoured health drinks demand among the young population along with its high nutritional values are the key factors significantly boosting industry expansion. Shifting consumer focus towards the nutrition level, taste, and convenience while purchasing food products will positively influence business growth. In addition, continuous development of multiple products owing to heavy R&D investments by leading players will further augment the industry growth over the projected timeline. Growing prevalence of cardiovascular diseases, obesity, diabetes, and gastrointestinal diseases along with increasing consumer spending on healthy food products will prompt the need for essential calories, nutrition, lactose, and sugar-free food products. Moreover, increasing consumer perception towards calorie-conscious individuals coupled with the benefits provided by these products such as control of blood sugar & cholesterol levels, bone health, and bowel health will further fuel the dairy alternative products demand. Extensive R&D investments made by leading market players owing to intense competition in the industry will provide a strong business outlook. New technologies and methods for the enhancement of dairy free products such as removal of flavour & inhibitors, enhanced shelf life, and fortification of food items will support the industry growth. The incorporation of latest technological methods, such as Ultra High Processing (UHT) and enzymatic liquefaction for the efficient manufacturing of multiple dairy free food items will provide robust outlook for the industry. In addition, rising popularity of enzymes such as proteinase, amylases, and pectinases for better yield of non-dairy products will further augment the industry landscape over the forecast timeframe. Favourable government policies and regulations pertaining to the promotion and manufacture of dairy-free products will boost the business share. 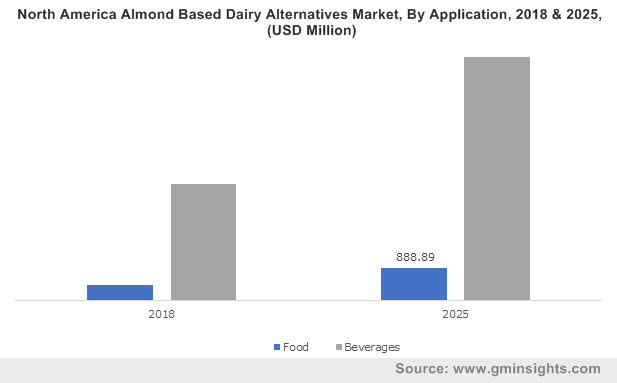 The major players including SunOpta Inc., Archer Daniels Midland, Valsoia S.p.A, Triballat Noyal, and Malk Organics are providing a strong business outlook for dairy alternatives market size from 2019 to 2025. However, cross contamination of raw materials in the production of several food products may pose as a major threat to industry growth. In addition, fluctuating raw materials prices due to various environmental factors may further hamper the dairy alternatives industry expansion. Almond and soy-based food & beverage products account for over 80% of the market share in 2018. Products with almond-based ingredients are loaded with antioxidants that protect against oxidative stress that damages the cells in the human body and contribute to aging, inflammation, and diseases such as tumours, cancer, etc. It also limits the low-density lipoprotein or bad cholesterol in the blood. As per FAOSTAT, the U.S. contributed to around 45% of the overall production of almonds (with shell) with 1,029,655 tons in 2017. Furthermore, these products can help in regulating cholesterol levels and blood pressure by improving the overall diet and offers benefits to the skin, kidney, and heart. Soy is generally used as food supplements. Soy-based products are widely used as a primary ingredient in dairy-free products owing to benefits including the ability to maintain cardiac health, improve the metabolism, and help in healthy weight gain. Soy milk contains natural compounds such as isoflavones, which reduces the risk of heart diseases and breast cancer. Products manufactured from soy are considered equivalent or higher than dairy milk in terms of nutritional value, thereby providing viable substitute to dairy products. The dairy alternative foods demand has escalated substantially over the last few years owing to increasing consumer awareness regarding its functional properties. It can be used as an additive to improve texture, as a bulking agent, fat replacer, and as an antioxidant. They are beneficial for patients suffering from high cholesterol, diarrhoea, and other gastrointestinal illnesses. Cheese, desserts, and snacks are the key end-use applications for dairy alternative food. Growing health awareness, socioeconomic development, increasing affordability of products, and favourable initiatives taken by the governments, such as nutritional guidelines, will positively impact the dairy alternatives market share over the forecast timeline. The sweetened dairy alternatives segment will emerge as a prominent type of dairy alternative that is used across multiple industries. The growing demand from the infant and young populace requiring added sugar and improvements in taste and flavour will provide opportunities for product penetration during the projected timeframe. Sweet-tasting almond, rice, hemp, and oats milk serve as effective substitute for people with milk allergies and lactose intolerance. Sweetened dairy alternatives are used in a wide variety of applications including desserts, yogurts, ice-creams, cheese, and milk products. Mainstream stores and supermarkets hold a dominating share in the dairy alternatives industry. Key players including Walmart, Tesco, Kroger, Albertsons, Whole Foods Market, etc., have a strong foothold in the distribution of the dairy alternative products. Presently, vitamin and calcium-fortified dairy-free beverages have become readily available to consumers via. these stores, thus providing new growth avenues. Changing consumer preferences with respect to sweetened or unsweetened formulations along with the inclusion of nuts and legumes in dairy-free products have provoked these stores to maintain a stockpile of these products. This ensures continuous supply to the consumer, thereby increasing business growth. Asia Pacific is projected to witness the fastest growth at over 10% from 2019 to 2025. Economic development, improved standard of living, increased consumer spending on foods, and influence of western trends will provide an impetus to dairy alternatives market size. Rapid growth in the population, liberalization of FDI in the food industry, increase in consumer awareness about health & fitness, and rapid rise in purchasing power are the key factors driving the product demand across the region. The shift in consumer preference is a result of the growing prevalence of obesity and lactose intolerance among young and aging populace. 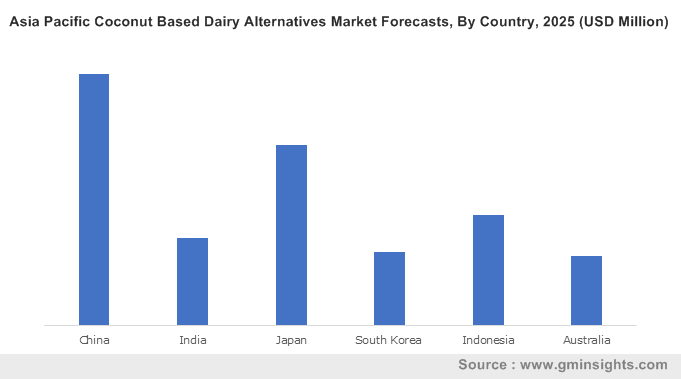 North America accounted for over 25% of the global dairy alternatives market in 2018. Increasing nutritional & healthy products demand coupled with rising consumer consciousness toward health & fitness are expected to provide significant gains over the forecast timeline. In addition, the willingness of consumers to pay premium prices for healthy and nutritious products will offer a positive outlook for market growth. 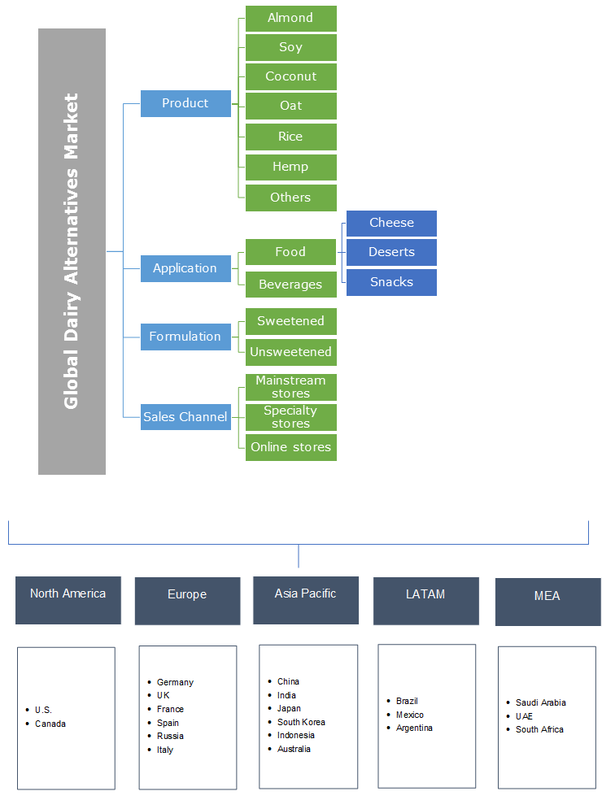 Europe holds a substantial share in the global dairy alternatives market. Increasing count of mainstream and specialty stores coupled with shifting trend towards food products with low-cholesterol content are the key factors contributing to the rising product demand across the region. Increasing inclination toward packaged foods, ready meals, and instant foods will further propel the regional share up to 2025. Additionally, extensive R&D expenditure on developing dairy-free products that are gluten-free and fortified with additional nutrients are positively influencing the business growth. Hain Celestial Group, Sunopta, Whitewave Foods Company, Freedom Foods, Blue Diamond Growers, and Valsoia S.P.A are some of the key manufacturers in the industry. The business participants are extensively focusing on product innovations, new product launches, mergers, and acquisitions for expanding their geographic foothold and capturing greater market share. For instance, in September 2014, WhiteWave Foods Company announced the acquisition of So Delicious, a manufacturer of plant-based beverages and frozen desserts with an investment worth USD 195 million. The initiative enabled the company to expand its product portfolio and serve the consumers across North America and Europe. The shifting trend from conventional dairy products such as cow milk to nuts and legume-based milk products along with rising consumer concerns for maintaining a healthy diet will be a key factor influencing the industry dynamics. The growing vegetarian and vegan population, motivated towards animal welfare concerns, choose plant-based beverages which additionally contributes towards the industry expansion. The food industry has been proactive in identifying changing consumer behaviour and has accordingly invested extensively in product development of substitutes to dairy and dairy-based products. This has led the industry participants to develop dairy free products including ice-cream, cheese, snacks and yogurt with an increased amount of protein and reduced calories & saturated fats.